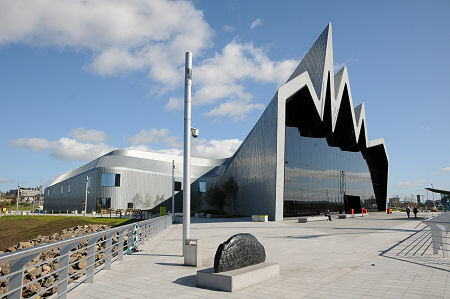 Glasgow's magnificent Riverside Museum opened to the public in the Summer of 2011 and is justifiably popular. It stands on the north bank of the River Clyde in what is becoming known as Glasgow Harbour, immediately to the east of where the Clyde is joined by the River Kelvin. It is most easily accessed via the Clydeside Expressway and is also well served by public transport. The Riverside Museum is home to Scotland's Museum of Transport and Travel and the iconic building provides a fitting home for its superb collections. The Museum of Transport was previously housed in Kelvin Hall, opposite the Kelvingrove Museum. You can see our feature about the museum in its old home here. One of the particularly nice things about the new museum is that the neighbouring Pointhouse Quay is now the permanent home of "The Tall Ship", the Glenlee. Entry to the Riverside Museum is free (though parking is pay and display), while there is a charge for boarding The Tall Ship. The Riverside Museum was the first large public building in the UK to have been designed by the internationally-renowned architect, the late Zaha Hadid. The architect describes the building as "a sectional extrusion open at both ends." The shape of the cross section is reminiscent of a jagged wave, and you can think of the form of the building as symbolising the recreation of Glasgow's links with its riverfront. Most visitors, however, will simply think of the building in terms of its innate beauty. It is obvious from the moment you first see it that the Riverside Museum will become a Glasgow icon: this is a building it is possible to love at first sight, and it only gets better the more you see of it. Iconic buildings don't come cheap. 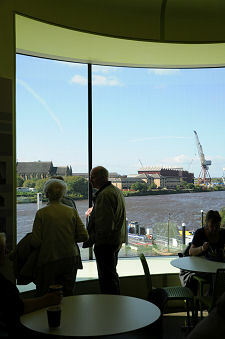 The Riverside Museum took four years to build and fit out, and cost a total of £74m. Glasgow City Council contributed £50.9m towards this total cost, with a further £18.1m coming from the Heritage Lottery Fund. The remaining £5m was raised through a public appeal. The old home of the Museum of Transport was, in effect, a very large squarish shed with a large mezzanine floor, and what it lacked in mod cons and design, it made up for in terms of sheer space. For those familiar with the old museum, the key question on entering the Riverside Museum is how it works as a home for the outstanding collections that are housed here. The answer, reassuringly, is "very well indeed". The plan of the Riverside Museum is in the shape of what can only be described as a squiggle, and as a result it is not possible to see its full extent on entering, or from any single vantage point. The Riverside Museum uses some very clever devices to display its collections. Of particular note is the use of the height of the spaces in the museum to produce some very impressive effects. One side of the north end of the museum is home to the Wall of Cars: cars placed on platforms attached to the side wall at three different levels. The effect is extremely impressive. A similar effect is produced elsewhere in the museum with the Wall of Motorcycles, though here it is possible to get closer and appreciate the more intricate detail. Carrying on the three dimensional theme, the bicycle velodrome, almost in the form of a very large bicycle wheel, hangs overhead in the body of the museum, with part of the museum's collection of bikes attached. But perhaps the most impressive excursion into the third dimension is the way a railway steam engine has been displayed on the first floor, with its front projecting out over part of the main floor below. The result is a highly unusual, and oddly fascinating, view of the engine from some distance below. Many of the old favourites from the old museum are on view in the Riverside Museum, though almost all in a more dynamic setting. The collection of Glasgow buses and trams are all on show, and some can be boarded, and there is a display of the layout of one of the most modern trains to run on Glasgow's railways. Older trains are well represented. 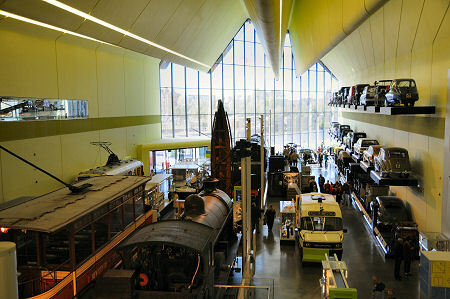 The museum's huge South African steam locomotive is on display at the south end of the museum, while other steam trains very effectively share space at the other end of the building. Visitors to the old museum loved the recreation of an old Glasgow street, "Kelvin Street", complete with vehicles and shop fronts. The theme has been carried into the Riverside Museum, but on a bigger and better scale. One part of the museum is now set up to recreate a Glasgow street scene of the era 1895-1930. This seems larger in scale than in the old museum, and it is also a great improvement in that many more of the premises are fully fitted out and can be entered by visitors. As a result visitors can now explore a cafe, a pub (the Mitre), a pawn shop, a cabinet makers, a shoe shop, a photographer's, and the subway, amongst others. In the new museum this approach has been taken a step further with a second area of shops representing business premises as they typically appeared between 1930-1960 and 1960-1980. These front onto the main body of the museum, which is set up as a typical Glasgow street of the era, complete with traffic jam. The range of shops include a fascinating model shop, a bike shop, a car repair shop, and a shop apparently specialising in Star Wars merchandise and memorabilia from the 1970s. One interesting result of the new approach is that the museum now has two recreated subway stations rather than the one in the old museum. One of the highlights of any visit to the old Museum of Transport was the Clyde Room, home to a breathtaking collection of some 250 highly detailed ship models, some very large indeed and most of ships actually built on the Clyde, with the models produced as promotional tools by the firms that made the ships themselves. The ship models remain on view in the Riverside Museum, but rather than being displayed in a single room, they are now deployed in a number of different areas. Some of the largest are imposing enough to hold their own among the full size exhibits in the main areas of the museum, while elsewhere wall displays hold impressive collections: and an area of the first floor makes good use of some of the models in a display about the use of camouflage on ships. Many of the ship models are now on view in the Ship Conveyor. This is found on one side of the first floor and the models are slowly transported around the conveyor, illuminating information displays with details of each as they pass. It works very well, and the new approach probably means that the ship models are more appreciated by more people than was ever the case in the past: though there's still a slight sense of regret at the loss of the sheer sense of wonder that arose on entering the old Clyde Room. The physical needs of visitors have not been overlooked. Part of the south front, looking out over The Tall Ship, is home to a café offering everything up to fairly filling meals. Extra seating is available in good weather out on the quayside. Meanwhile a corner of the first floor is home to a coffee shop. Other aspects of the first floor of the museum, which can be accessed by lifts at both ends as well as by stairs, should not be overlooked. The exhibits on view are fascinating, but there are two other important reasons to visit. The first is that it offers superb views down into the body of the museum, allowing an appreciation of the layout and collections that is simply not possible when you are down in the midst of them. The second is that an important aspect of the design of the museum can only be appreciated from the first floor: this is the very clever positioning of windows clearly intended to connect the museum with the River Clyde.